Eclectic Paperie: Pink is In! Just wanted to post that we finally received our backorder on the Belle(Pink) Fabric Creativity Bads. They will hold a laptop and so much more. Think of it as a fashionable summer beach tote, too. We also received some new Stampendous sets called Sassy Silhouettes and Fashion Friendzy. Some new Cat's Eye Chalk and new Junkitz paper lines have also made it's way into the store. The newly released MFT stamps (Fright Night & Falling For You) sets are also now available. They are oh-so-cute! If you haven't sign-up for our newsletter, don't miss out on news about specials and announcements that we may run. We have a good promotion lined up for you this week. We also have a weekly feature introducing an "eclectic friend" and her blog. You can sign up on our store home page....just scroll down to the bottom of the left hand column. I get to go be a teacher's assistant at CKU Anaheim tomorrow and I am so excited. I might not be able to make the projects but I will get the kit(s) after the class sessions and will hopefully have time to make and show you all next week. 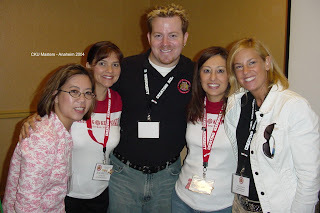 Here's a photo of me from my CKU Masters(Anaheim, 2004) a couple years ago. I took a class Tim Holtz taught. I am on the far left with my scrappin girlfriends Jeannette & Suzanne. That's Tim and Nancy(from Ranger Industries). I got to be a "student" last time and it was a blast.